I’m still working like a mad-woman to use up all this rhubarb in my garden. I froze a whole bunch, gave some away, and I still have a bit more to harvest. I found this recipe, and since it was pretty low on the sugar side, I gave it a go. I love the crust. Would think this recipe would be great with just about any fruit that is in season. I ate this all week for breakfast, and maybe for dessert too…but who’s counting?! I whipped these quiche up for lunch when I was having some ladies over for a clothing swap. I figured if there was any leftover I could eat it for lunch for the week. Wishful thinking- these got almost all eaten up! they were a huge hit and there was only one vegan there! I will be making these regularly and need to remember this recipe for any upcoming potlucks. You can customize the veggies any way you prefer. I made one with brocolli and cheddar daiya and another with tomato, cilantro and cheddar daiya. I found the recipe over on kittee’s blog. Put the tofu, cashews, and hot sauce in a blender and process until smooth. This will take a bit of time, so go slowly. If your blender is having a hard time, add a few tablespoons of the non dairy milk to help get things going. Add in the nutritional yeast, miso, granulated onion, garlic, paprika, salt, baking powder and starch. Blend until completely smooth, then transfer to a bowl and stir in your chosen chopped vegetables and/or cheese shreds. Scrape the tofu mixture into your pie crust and smooth the top with a spoon or spatula. Cover the pie edges with foil and bake for 40 minutes. Remove the foil and bake for 10 more minutes until the crust is golden. Let cool for at least 30 minutes before slicing. This is the pie crust I used. Somehow I got two pie crusts out of it too! It’s apple picking season! So time to break out the apple recipes. We went apple picking and got a 1/2 peck of golden delicious, empire, and a few red delicious. 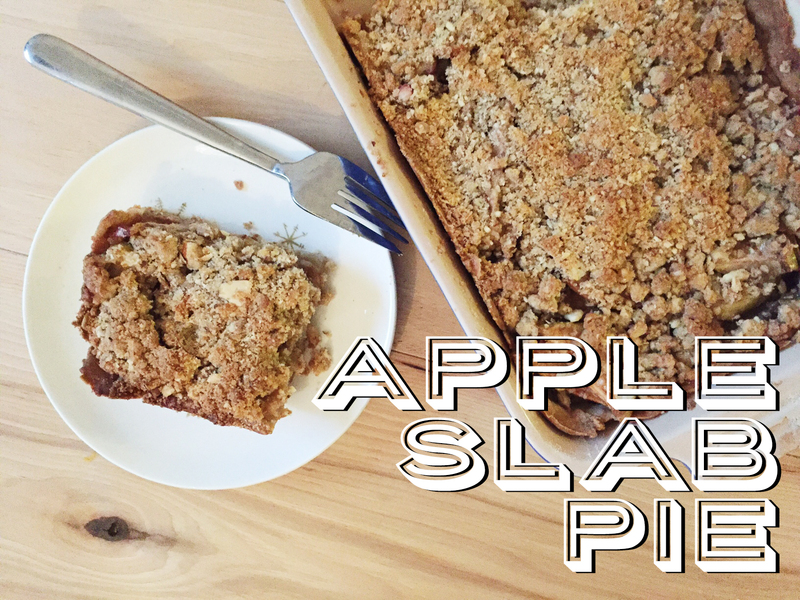 I took at stab at making this apple slab pie, since I had some leftover dough. It would normally call for a 9×13 pan, but i didnt have enough dough, so I halved the recipe and put it in a smaller, rectangular pan (probably equal to about 8×8, just proportioned differently) and it worked out perfectly. I veganized the recipe, added some of my own elements. I will DEFINITELY be making this again. It turned out to be so fantastic! Preheat oven to 375°. Prepare pie crust according to directions and pat it into the bottom of a 9×13 pan. In large mixing bowl, combine apple slices, sugar, lemon juice and cinnamon. Spread in an even layer over crust. In the food processor, combine the flour, butter, and brown sugar, pulsing until coarse crumbs are formed, Add the chopped nuts and oats and pulse a little bit more. Sprinkle crumb top over apple layer. Bake for 45 minutes to an hour or until filling bubbles. Cool completely. If preparing ahead of time to freeze. Wrap with foil and label prior to baking and freeze. Then, when ready to serve, bake the frozen pie at 425° for 15 minutes. Reduce heat to 375° and continue baking as directed. Labor day weekend means end of summer – but also means sweet, juicy peaches are in season and a plenty at my farmers market. 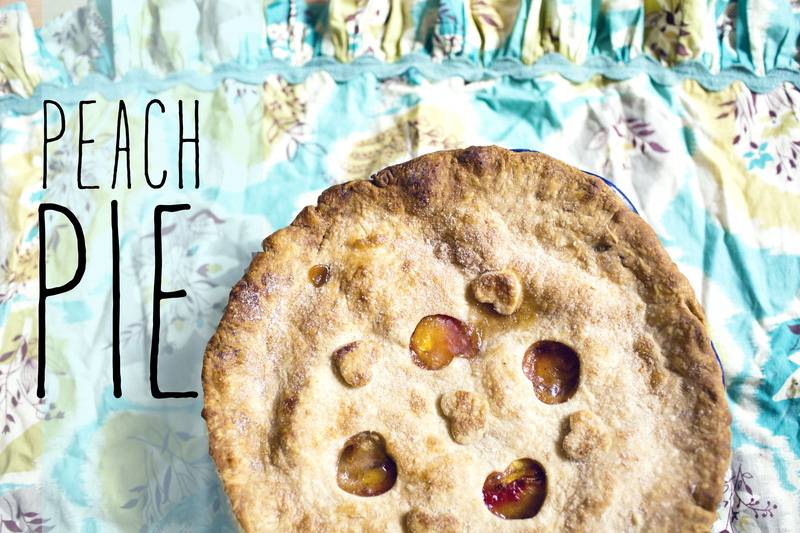 I figured the perfect way to say goodbye to summer would to be to bid farewell with a pie! hope everyone had a great summer – i know its officially still around for a few more weeks, but now that the kiddos are back in school and some fall crops are popping up (there was gourds at my farmers market ) were going to have fall on the brain in no time! To make the crust, in a medium bowl, whisk together flour, sugar, and salt. Add cold, cubed earth blanace and, using your fingers, work the butter into the flour mixture. Quickly break the butter down into the flour mixture, some butter pieces will be the size of oat flakes, some will be the size of peas. Stir together the ice cold water and vinegar. Create a well in the earth balance and flour mixture and pour in the water and vinegar mixture. Use a fork to bring to dough together. Try to moisten all of the flour bits. On a lightly floured work surface, dump out the dough mixture. It will be moist and shaggy. That’s perfect. Divide the dough in two and gently knead into two disks. Wrap each disk in plastic wrap and refrigerate for 1 hour. To make the filling, wash and slice peaches. In a medium bowl, combine peach slices. In a small bowl, whisk together sugar, spices, flour, and cornstarch. Pour the sugar mixture over the fruit, and gently toss together with a wooden spoon. Stir in the lemon juice. Place bowl of fruit in the fridge to rest while you roll the crust out. Preheat oven to 400 degrees F. Place a rack in the center of the oven, and place a baking sheet on the lower rack, just below where you’re going to place the pie. This will catch any pie drippings without making a mess of your oven. Remove one of the pie dough disks from the fridge. On a lightly floured surface, roll dough out into about a 13-inch round. Roll the dough a few strokes, then use your fingers to move the emerging circle around the floured surface. This ensures that the dough isn’t sticking to the work surface. The circle won’t be perfect, that’s ok. Try not to get any tears in the rolled out dough, but if you do, they can be patched together with extra dough. When you roll the dough and you can see it start springing back, that means that the butter is warming and the crust shouldn’t be rolled out anymore. Gently lift the 13-inch round from the floured surface and center in the 9-inch baking dish. Place in the fridge while you roll out the top crust. Roll out the top crust just as you did the bottom crust, moving the dough across the floured surface every once in a while, and creating a roughly 13-inch circle. Remove the bottom crust and fruit filling from the fridge. Gently pour the fruit filling into the pie dish. Carefully remove the top crust from the work surface and drape over the fruit in the pie dish. With a small knife, trim the crust, leaving about 3/4-inch overhang. With your fingers press the top and bottom crusts together and fold under. Use a fork or your fingers to crimp the edges of the dough. Cut five small slits in the top of the crust so the juices and steam can vent. Brush lightly with some almond milk and sprinkle with cinnamon sugar mixture. Place pie in the oven and bake at 400 degrees F for 15 minutes. Reduce the oven heat to 375 and bake for 45 to 55 more minutes. Remove from the oven when crust is browned and golden, and the juices are bubbling. Remove from the oven and allow to cool for 2 hours before serving. Place covered in the fridge to store. Pie lasts up to 3 or 4 days.